Lexus is proud to introduce its newest addition, the 2019 UX. It offers the brand’s innovative luxury and safety in a compact crossover package that combines charismatic design elements and ultra-efficient new powertrains. For many customers, the UX will not only be their first Lexus but also their first luxury vehicle. "The Lexus UX is designed for the modern urban explorer seeking a fresh, contemporary and dynamic take on luxury driving. The UX was designed to appeal to young buyers who seek not only what is new and exciting, but what’s also relevant to their lifestyles," says Glenn Crompton, Vice President of Lexus Sales and Marketing. 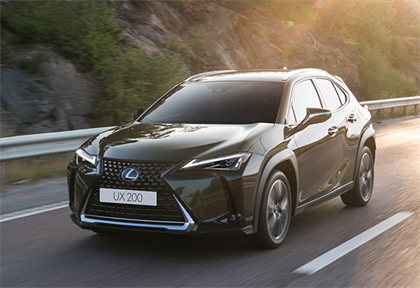 Infused with a dynamic attitude, the 2019 Lexus UX is engineered to deliver quick and engaging driving with a Lexus-smooth demeanour, making it a unique entry in the luxury compact crossover segment. The 2019 UX is the first Lexus constructed on the new Global Architecture Compact (GA C) platform. A lightweight yet super-rigid structure, extremely low centre of gravity and refined suspension tuning endow the UX with exemplary handling agility and ride comfort, along with a distinctive driving personality. "Lexus wanted to positively overturn the image of a crossover with a high body that requires careful manoeuvring, and offer a car with nimble performance and excellent manoeuvrability that makes it as easy to drive as a sedan," says Chief Engineer Kako, Executive Vice President of Lexus International. It is available in two FWD versions: the UX 200 introduces a new high-efficiency 2.0 litre, four-cylinder engine coupled with a new Direct Shift Continuously Variable Transmission (D CVT), while the UX 250h pairs an even higher-efficiency version of the 2.0 litre petrol engine with a new fourth-generation hybrid drive system engineered specifically for this platform. The model range also includes an F Sport model in 200 guise. The UX is a leap forward in the compact luxury crossover segment. Lexus designers created an overall design theme inspired by a secure, robust look crossover with the stance of a sports car. The spindle grille, though sharing its basic form with other Lexus models, is unique to the UX. 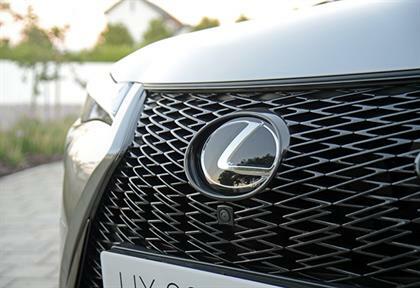 It features a new block-shape mesh pattern with individual elements that gradually change in shape as they radiate out from the central Lexus emblem. The grille creates an intriguing three-dimensional appearance that changes with the viewing angle.The headlamp design completes the UX’s face, giving it a determined, confident gaze. Daytime running lights arranged in an arrowhead motif above the headlights complement the Lexus L-shaped lighting signature. These appear like brows above the standard single-projector dual-beam LED headlights. The full-width rear lights project a distinctive night-time signature formed by a sequence of 120 LEDs tapering toward the centre, measuring just 3mm thick at its narrowest point.The vehicle’s basic form flows out from the lines of the spindle grille to envelop the cabin. Crisp, prominent sculpted surfaces and dramatically flared front and rear fenders reflect the robust inspiration, while an aerodynamic profile, large wheels ‘push’ the corners and an impressive front fascia create the agile, sporty stance. Takumi (Japanese for "artisan") modellers worked with design and engineering to refine all exterior surfaces of the UX. The wheel arch mouldings that protect the body from gravel thrown up by the tyres, use airflow over their edges to reduce turbulence and lift, contributing to the vehicle’s stability. A similar contribution is made by the rear combination lamps. Unique Aero Stabilising Blade Lights begin at the top of the rear fenders and span the rear of the vehicle. By guiding airflow around the rear of the UX, this design also reduces turbulence and lift, benefiting vehicle stability when cornering and driving in crosswinds. A wing-type spoiler at the rear edge of the roof, along with a flat underbody, contribute to vehicle quietness and fuel efficiency. In yet another world first, the standard 5-spoke 18 x 6.5" aluminium alloy aero ventilating wheels feature Gurney flaps along the spoke edges designed to reduce wind resistance while also increasing the airflow to cool the disc brakes. The design pulls air from the inside of the wheel, while the airflow on the outer side of the vehicle is regulated to follow the wheel surface. It is offered in a palette of 13 exterior colours to accentuate its stunning lines. Two of those colours, White Nova and Heat Blue, are exclusive to the F Sport. Blazing Carnelian (red) creates vividness and a sense of depth using a multi-layer painting process that combines a red-colour base layer with a yellow interference mica layer. Celestial Blue creates a solid blue colour with glass flakes that sparkle in the sunlight. The F Sport package is available exclusively in UX 200 guise. Bespoke F Sport suspension tuning includes specific springs and stabiliser bars, plus a rear performance damper for a more refined ride. The 18", five twin-spoke aluminium alloy wheels unique to the F SPORT are even more rigid than standard UX wheels, contributing to responsiveness and handling agility. The F Sport package comes standard with a UX-tailored version of the new high-response Adaptive Variable Suspension (AVS) system that debuted on the Lexus LC and LS flagship coupe and sedan. The system increases damping force to minimise roll when cornering or changing lanes and reduces damping force in straight-line driving to preserve ride quality. With AVS, the vehicle’s Drive Mode Selector adds the Sport S+ mode which activates the system. The F Sport transformation includes an exclusive grille design featuring a mesh-pattern created by individual L-shaped pieces. The exclusive F Sport front bumper features large fog lamp bezels with L-shaped chrome mouldings and the same mesh pattern as the grille. A revised rear bumper and jet-black trim on the front and rear mouldings complete the F Sport look.F Sport-exclusive interior features include front sports seats made with a highly supportive integrated-foaming technique first developed for Lexus F models. The digitally-rendered instrument meter features a movable virtual ring inspired by the Lexus LFA supercar. A leather-covered F Sport steering wheel, leather-trimmed shift knob, 8" TFT colour display, aluminium pedals and footrest are also part of the package. The driving experience is further enhanced with Active Sound Control (ASC), which generates the aural effect of up- and down-shifts like those of a geared automatic transmission. An additional Sonic Interaction Design (SID) function adjusts the sound the vehicle makes when driving in Sport S+ mode (S+ Sound). At the same time, the UX interior design creates a sense of security suggested by the exterior’s inspiration. As one example, the form of the interior door shoulders evokes robustness, expressing a secure feeling inside the vehicle.Designers created a feeling of seamless continuity inside the UX. From the driver’s seat, the upper section of the instrument panel appears to extend out beyond the windshield into the fenders giving the driver an excellent field of vision and a clear sense of the vehicle’s dimensions and tyre placement. When viewed from outside the vehicle, the hood appears to connect directly to the instrument panel through the windshield, blurring the boundary between interior and exterior. Entering and exiting the UX is made easier through optimal placement of the hip-point and unique shaping of the seat cushion. The human-centered approach shows clearly in the instrument panel’s low, unobtrusive design and the slim A-pillar mouldings, which are shaped to improve visibility. Even with a higher seating position than a standard passenger car, the reduction in distance between the hip and heel points gives the UX driver a feeling of being closer to the road than in a conventional SUV. Typical of Lexus, the UX offers quiet driving experience, thanks to the high-strength structure and optimal placement of specially designed sound-absorbing and insulating materials throughout the body. Also in typical Lexus fashion, engineers traced noises to their sources to keep them out of the cabin. Even the sound of water being thrown up by the tyres is reduced. It offers 6-way manual (UX 200 EX) or 8-way power-adjustable (F Sport and Hybrid) front seats, the latter with adjustable lumbar support for the driver. Front seat cushions use springs and foam specially designed to gently envelop occupants while uniformly dispersing pressure under the occupant’s sciatic area. The UX F Sport features exclusive front seats with integrated-foaming construction, which helps the seats conform to the occupant’s body. With this process, the upholstery is set into a mold and is then filled with foam to complete the seat in a single process. The special 8-way power-adjustable front seats feature lumbar adjustment, as well as manual forward/backward adjustment for the headrests.Lexus luxury extends throughout the UX cabin. The three-spoke steering wheel and analogue clock come from the Lexus LS, for example, and Lexus Climate Concierge, as used in other Lexus models, automatically links heating and cooling airflow with the heated and ventilated seats to optimise interior temperature comfort. Renowned Lexus attention-to-detail is also evident in a headliner design that eliminates distracting shadows at the windshield header, as well as control switches with a signature "Lexus feel." Lexus UX Chief Engineer Kako drew on her extensive experience in materials development and time spent working in Europe to help define the UX interior’s appearance and quality. The result is an uncluttered "less is more" approach that makes the UX feel more inviting and accessible. The Lexus UX offers a wide choice of interior colour combinations, each of which conveys a specific mood and accentuates the premium design. The seating is available in simulated leather (UX 200 EX) or smooth leather (F Sport and Hybrid). The EX and Hybrid models offer a choice of five colours, including Cobalt, Black, White Ash, Rich Cream and Ochre. In addition to Black, the F SPORT also offers exclusive Flare Red or White seat colours. The UX instrument panel design combines unique Lexus traits and intuitive technology. A" TFT LCD display meter digitally creates realistic, analogue gauges in a three-dimensional space.The F Sport features a larger 8" TFT LCD display. For the F SPORT only, the movable meter ring, which originated in the Lexus LFA supercar and is also featured in the LC premium coupe, allows displayed content to be easily changed. Pushing a switch on the steering wheel moves the ring to the right and enlarges the multi-information display.The Lexus Remote Touch Interface (RTI) with haptic feedback in the 2019 UX is designed to feel as familiar to use as a smartphone. The RTI utilises intuitive operations, such as double-tapping and flicking, to mimic common phone gestures. Frameless construction eliminates edges, and a special coating on the touchpad surface lets fingers easily slide over it while minimizing the appearance of fingerprints. Touchpad surface haptic vibrations indicate to the user when the cursor is moved, making it easier to align the cursor with the desired function button. A switch at the base of the touchpad can call up an operation screen with related functions, such as air conditioning and navigation, enabling easier access without going through menus. In a unique touch of high-tech elegance, the Lexus logo on the pad surface is backlit at night. The F Sport and Hybrid models feature illuminated vent controls with distinctive LED light sources wirelessly powered by an electromagnetic resonance of two adjacent magnetic coils vibrating at the same frequency. The vent control LEDs use mirror optics in the same design principle as the Lexus LC’s tail lamps to create the effect of deep floating light sources, even though the light element is just 3mm thick. The Lexus UX offers the brand’s renowned luxury and comfort in a package ideally suited to making urban exploring easier in cities. A 26,4cm wheelbase contributes to a smooth, stable ride and cabin roominess. The 4495mm length and best-in-segment 10.4m curb-to-curb turning diameter help make the Lexus UX easy to manoeuvre and convenient to park.Getting in and out is easier thanks to factors including the optimal placing of the hip-point, a cut-off profile for the rocker panel below the doors, and the shape of the seat cushion. For interior storage, the UX offers the largest console box in its class.Fold-down grocery bag hooks remain flush with the side panel surface when not in use. For convenient loading and unloading, the UX F Sport and Hybrid models are available with a hands-free power tailgate. This can be opened and closed by moving one’s foot in front of a sensor located underneath the rear bumper while the drive is carrying the smart key.The UX features run-flat tyres. These are newly-developed second generation run-flat tyres which are quieter and more comfortable than previous designs, while now allowing driving with a flat tyre at speeds up to 80 km/h for up to 160km. The 2019 Lexus UX models offer the latest in the brand’s multimedia and navigation technology. A 7-inch EMV (Electro Multi Vision) display is standard, and a 10.25" EMV (F Sport model) display is used with the available Lexus Navigation system. The standard Lexus Premium Sound System can play back the highest-resolution digital audio formats from a USB device, conveying more musical data than a CD. Dual rear-seat USB ports enable passengers to use and re-charge their smartphones or tablets.The standard 8-speaker system uses bamboo charcoal speaker diaphragms to reduce mass and deliver natural-sounding voices and improved mid-range sound. Both systems create a more lifelike sound stage by using tweeters mounted at the sides of the instrument panel reflecting sound off the windshield. The 8-speaker system adds a centre-dash tweeter, a subwoofer mounted in the luggage area and a more powerful amplifier. The available Mark Levinson Premium Surround Sound System — a segment exclusive — has a 13-speaker array, low-distortion 668W Class D 8 channel amplifier, Quantum Logic Surround Sound and ClariFi™ 2.0 technology to deliver an immersive concert-like sound experience in the UX. This is standard on the F Sport and Hybrid model.A SOLID STRUCTURE TO BUILD ONLexus instilled the UX with an outstanding combination of handling agility and smooth, quiet ride comfort that urban customers will find pleasing. Key to achieving that balance is building the UX around the high-strength GA C global architecture platform. By using aluminium for the side doors, fenders and hood and composite materials for the tailgate, the UX has the lowest centre of gravity of any vehicle in its class at 594mm. As a result, the UX delivers a secure, agile feeling normally associated with lower sport hatches. The MacPherson strut front suspension and multilink rear suspension with trailing arms, both mounted to sub-frames, are specially tuned to deliver a combination of agility and comfort over well-worn urban street surfaces. Vehicle Stability Control (VSC) helps the vehicle trace the driver’s desired line through a turn by applying some brake control on the inside wheels, suppressing the tendency to understeer. As a result, the UX drives through corners with greater precision while maintaining stability. Based on signal inputs from the steering, yaw rate and linear G sensors, AVS continually adjusts damping force to minimise body roll in cornering while maintaining optimum tyre contact and ride comfort on all surfaces. The damping force is reduced at low speeds and increased at high speeds. A newly developed electric tilt and telescopic steering column is available for the F Sport and Hybrid models, which is equipped with power-adjustable front seats. In addition, both these models have memory function - ingress and egress are made easier with the auto away / auto return controls linked to the driver’s seat belt and the engine start-stop switch or hybrid power switch. Using the switch, the tilt and telescopic motors can adjust the steering wheel up and down or forward and back through 40mm ranges.Standard 18 x 6.5" alloy aero ventilating wheels feature 225/50R18 tyres; the F Sport 18" alloy wheels get 225/50RF18 run-flat tyres. The aero 18" aluminium wheels are available in a standard silver metallic colour. Each model grade has a bespoke tyre design. As mentioned, the UX offers exclusive F Sport-specific wheels. It delivers a combination of engaging performance and high efficiency from a new 2.0 litre inline four-cylinder engine. VVT iE intelligent variable valve-timing with an electric actuator also enhances drivability while reducing emissions. At 126kW, the UX 200 engine offers output similar to some competitors’ 1.5-litre turbo engines, but with less complexity, less under-hood heat, and lower powerplant weight for better vehicle balance. The engine produces 205Nm of peak torque to give the UX excellent responsiveness in all driving situations. Automatic Stop and Start furthermore enhances fuel efficiency and quietness in urban driving. The new Direct Shift-Continuously Variable Transmission (D CVT) combines the smooth, fuel-efficient performance of a continuously variable transmission with a more direct driving feel. The key to its distinct performance feel is a mechanical gear set that is used to start from a stand-still and accelerate before handing off to the continuously variable transmission pulley system. Linear and quick initial acceleration maintain the benefits of a continuously variable transmission at mid- and higher speeds. The result is quicker ratio changes during acceleration and an overall ratio spread that maximizes fuel efficiency. The petrol models deliver 126kW of power at 6600rpm and 205Nm of torque at 4800rpm, equating to a 0-100km/h sprint time of 9.2 seconds, topped off by a maximum speed of 190km/h. Lexus, the world leader in luxury hybrid vehicles, applied its engineering expertise to the 2019 UX 250h with a new-generation Lexus Hybrid Drive powertrain. With a total system output of 135kW, the UX 250h is not only the fuel efficiency leader in the UX family but also the performance leader. This hybrid provides exhilarating driving with high-speed responsiveness and a feeling of smooth, natural acceleration. The new hybrid system combines the new 2.0-litre four-cylinder petrol engine coupled with two electric motor-generators in a new-generation hybrid transaxle that is more compact, lighter and has less internal friction than previous Lexus hybrid systems. Compared to the similarly-sized Lexus hybrid, the power control unit of the UX is more powerful yet 20% smaller and 10% lighter.Optimising the level of electric motor assistance and engine rpm produces a linear acceleration feel without the engine having to run at high revs. Engine speed is synchronised with vehicle speed to create an immediate and continuous acceleration feel. The new transaxle mounts the electric motor-generators (MG1 and MG2) coaxially rather than in-line. The resulting smaller and lighter package reduces frictional losses by 25% compared to the previous Lexus hybrids. In addition, MG2 is now a higher-speed motor, yielding better performance and efficiency.The Sequential Shiftmatic feature delivers responsive engine braking force in six steps with a shift feel similar to a manual transmission, using steering wheel paddle shift switches or the S position on the shift lever. The speed at which the hybrid system can shut off the petrol engine, such as when driving on long downward slopes, has been raised from the 70 km/h of previous Lexus hybrids to 115km/h for the UX 250h. Locating the new compact and lightweight nickel-metal-hydride (NiMH) battery and compact cooling system below the rear seat helps maximise cabin and cargo area space, and their location supports the vehicle’s low centre of gravity. The Hybrid delivers 107kW of power at 6000rpm and 180Nm of torque at 4400rpm (total system output of 135kW), equating to a 0-100km/h sprint time of 8.5 seconds, topped off by a maximum speed of 177km/h (governed). • LED Adaptive High-beam System (AHS).The Pre-Crash System (PCS) couples with Dynamic Radar Cruise Control. The system can operate relative to a vehicle ahead that is travelling between 10 and 180km/h. PCS warns the driver of a potential collision and can apply the brakes actively if the driver does not do so quickly enough.Lane Departure Alert detects not only yellow or white traffic lane markings but can also detect the edges of the roadway. Lane Tracing Assist uses the Electric Power Steering motor to aid the driver in keeping the vehicle centered in its lane.Adaptive High-beam System (AHS) gives the UX driver the benefit of improved night time visibility while reducing the distraction of other drivers ahead or on-coming.